Info Scott John Morrison was born in Sydney and studied economic geography at the University of New South Wales. Before entering politics, he worked as director of the New Zealand Office of Tourism and Sport from 1998 to 2000 and managing director of Tourism Australia from 2004 to 2006. He was also state director of the New South Wales Liberal Party from 2000 to 2004. Morrison was first elected to the House of Representatives at the 2007 federal election. 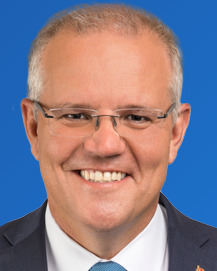 He was appointed to the opposition frontbench after the 2010 election. 05/18/2019 NSW MP - Cook ?? ?